I normally involve myself in a pre-planned open-invite group travels, not because I have no one to go and travel with but because it allows me to meet new people and make friends with them. It allows me to listen to new life stories and struggles, it gives me some sense of belonging, being with a group of people who doesn’t know who you are gives me that strong feeling of starting a fresh. Like I can be a different person, a better version of me. During my most recent travel, my wandering feet and my curious self led me to Carnaza Island, honestly i did not put any attention when I was invited by my fellow traveler about this Island, in fact twas the first time i heard about it. Only when i started researching and reading blogs about it did i know that Carnaza Island is part of Daan Bantayan in the north. My curiosity grew bigger when I saw how picturesque the island was with its beautiful landscape and turquoise clear water. You can walk and tour the island for your photoshoots! Oct 29, 2017 right after my night shift, I went straight ahead to our meeting place. And there my fellow dream chasers awaits, we were strangers but we had a common purpose and that was enough to for us to be comfortable with each other. In that 3-hour road trip to the north we rarely talk with each other we hardly even look at each other, but the silence was perfect only because it was still dawn. The the morning came And we finally arrived to our first stop, Tapilon port where we embarked into a boat to our final destination – Carnaza Island . So there we were, 15 people oozing with excitement. At this point we were already feeling a little bit more at ease with each, made some small talks, took some photos, all excited to talk about expectations about the journey in hand. Hours past and we can finally see the white sand from afar, the island did not disappoint it surely have amazing landscape. As soon as the boat dropped its anchor, I thought to myself, I had to get this place dissected. I wasn’t able to contain myself I had to explore the place. The view was breath taking, the clear blue water seemed so inviting, but dipping in the water was not part of the plan for this quick stop. With much eagerness i quickly disembarked from the boat and looked for a perfect spots to take photos of the place. It was amazing, the cliffs and the stone formation near the shore added more magic to the place it was pure heaven. I was able to find this small cave in one of the mountain in the island and it was a perfect spot to take photos. I indulge myself for a bit to appreciate the beauty in front me and then move forward to where my fellow travelers were busy taking pictures of themselves. It was a small mountain overlooking the twin beach where small fishing village resides. No wonder my fellow traveller hurried to this spot, it has a 360 view of the beach as well as the open water. And it was breathtaking, i took some awful lot time just exploring the mountain top. The cliffs were so jaw-dropping its as if its enticing me jump off it straight to the turquoise water. Anyhow, I had this fellow traveler whom I partnered with so someone can take pictures of me and vice versa, and we just clicked. We explored the rest of the mountain together and took some cool picture of each other, he completed my travel essentials. Photo buddy🙂. In the scorching heat of the sun we finally decided to head back to the boat. we lost track of time, all the other travelers were already waiting for us when we got there. As soon as we settled in the boat, the boatmen then maneuvered the boat to our campsite, Kang Elena Cove. It took us approximately 15mins to get there, the cove was a perfect location for a campsite. There were no houses nearby, there were newly built boats on works for paint jobs though, but aside from that the cove is literally isolated. Its as if we own the entire cove. As soon as I touched my feet on the sand I wasted no time, I hurriedly looked for a suitable place tie my hammock and pitch my tent. Moments passed and each of us was already settled in our private space, and then lunch time came. My friend, who’s the leader of this little venture already contacted someone from the island to prepare seafoods for our lunch they prepared crabs for us, back in twin lake we bumped into a local fisherman a fresh caught squids we bought that grilled them in the cove. Some of the travelers brought some food for lunch as well, and i must say it was a sumptuous lunch. At this point, were getting more and more at ease with each other. As time passes we learn more things about each other, we discovered we have lots of stuff in common. We didn’t even care how long we were sitting there eating, all we know is that its was fun sharing the food with these 13 strangers, and definitely fun knowing them little by little. Afternoon came and we were all full, feeling lazy to do anything I lay in my hammock just enjoying the moment. Some of my fellow traveler needed to go to the cemetery for some paint job for Dilon’s deceased friend’s wake. I opted to stay together with some other people. With nothing else to do we decided to start socializing, hence libation. So there we were, 8 not so strangers anymore, in the grass squatting, sharing life stories while drinks on hand. Its always my favorite part, learning life experiences, struggles and successes. There’s no single moment in my life when I feel bored socializing, it’s always fun. The days still young, all 8 of us already tipsy but full of life. The time seemed too slow in this part of the world, I swear to God the time seemed three times slower not that were complaining though. Sunset finally came and we transferred to the beach front, all of us under influence of alcohol but all conscious we stared blankly at the sunset as it changes the colors of the sky, it was pure bliss. One of the most beautiful sunset I ever witnessed in my existence. And then night came and it was all darkness in the cove, but we didn’t mind we know this was what we signed up for. The rest of the group finally came back and joined us at the beach, we then made bonfire to keep us warm while we continued sharing stories. The bigger the group, the more fun it became. Libation ended at 11pm, but that’s after we put our speaker on high volume, sang our heart out along with the music, one of us even started dancing her signature crab dance😂. It was pure fun! When the rest of them settled in their tents, we opted to be left behind enjoyed the warm of the evening water, gazed into the star-filled sky, spent another hour there and then finally settled in my hammock. So I lay there in my hammock underneath the sea of stars, it was heaven on earth. I lay there staring at the sky contemplating of the day that has been. Spending the entire day here in the island with all these random people was amazing, people with the same mindset as you are, people who just wanna have a good time. And in that one day, i feel closer to them more than with other people that i encounter on a daily basis. Its both weird and amazing how can you be so at ease with people you just met. Its must be because we share the same passion for traveling. Morning after a long night drinking sessions is always the worst, but to wake up to this view. It brings positive vibration. Morning are the best during camping, everybody’s busy with morning chores prepping food and stuff. And of course early morning dip. Right after we ate our breakfast we all of us started heading to the beach and enjoyed our remaining hours in the cove. There’s never really a dull moment when you’re with your fellow crazies. Any moment somebody would crack a joke and even if its not that hilarious hearing people laugh would make you laugh out loud as well. Our final day begun just like that. Another hour came and we finally left the cove and it was rather a rough ride to our next stop, LaManoc Island. Approximately 45 minutes boat right to this beautiful island. There we were insatiable for yet another paradise, like we haven’t spent the last 24 hours devouring Kang Elena cove. 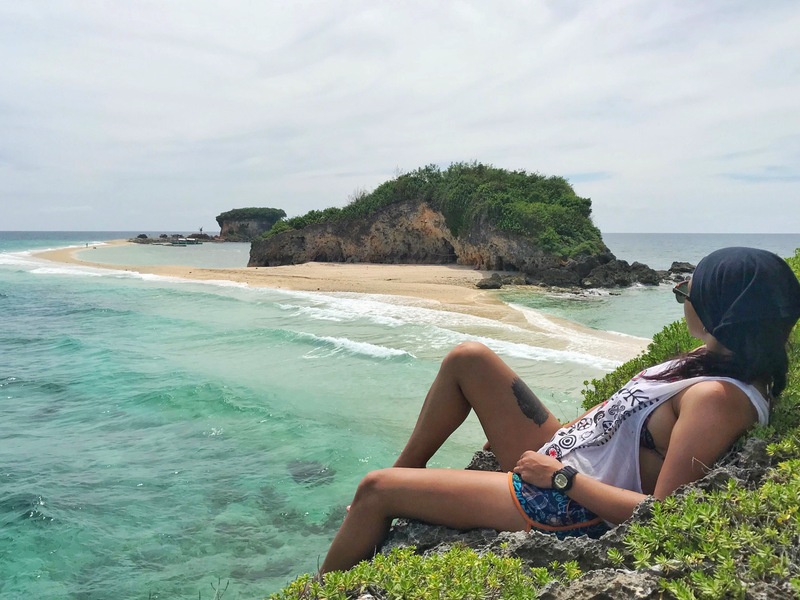 To our defense though, the island is pretty awesome it has this beautiful landscape and picturesque surroundings, it has this long white sand bar that connects two island together allowing us to explore the other adjacent island. It was perfect, the sun was on its peak, the water so clear and I can’t get enough of the of the picture perfect white sandbar. And in that island, 15 souls lost themselves. 15 wanderers was enchanted by the beauty that was LaManoc Island. 15 strangers turned friends made and left memories nobody can take away from us. And just like that, we ended our 2 day trip to Carnaza. At the end of this trip I can only say two things. 1) We went here as 15 complete strangers, we were going home as friends. 2) We will definitely find our way back to Carnaza Island, may it not be together but for sure this wont be the last of us visiting here. The island is exceptional, there is something in this island that keep our wanderlust burning. It keep us thinking of more travels to come. hi Nova! we’re planning to go to Carnaza this Saturday and I found your blog very helpful…can I ask you a few questions? Is there food available in Kang Elena Cove? We decided to stay there instead of carnaza Eco Park… thank you! Unfortunately there no stores sa kang elena cove. Its really isolated cove. We camped there and brought our own cook tools. But theres actually access to the nearest barangay. Im not so sure thou if they sell food commercially. Reblogged this on NOVA'S TRAVEL ADVENTURE.